The fish species Chromis viridis is known under several different names in English, such as Blue-green Chromis, Blue Green Chromis, Green Chromis, Blue-green Damselfish, Blue Green Damselfish, Blue-green Puller, Blue Green Puller, Green Puller, Blue-green Damselfish, and Blue Green Damselfish. Chromis viridis has not been evaluated for the IUCN Red List of Threatened Species. The Blue-green Chromis is found in the Indo-Pacific. Its natural range stretches from the Red Sea to the Line, Marquesan, and Tuamoto islands. Northwards, the species is found up to the Ryukyu Islands of Japan. Southwards, the range proceeds down to New Caledonia. Blue-green Chromis can be found in large aggregations over thickets of branching corals such as Acropora. They prefer sheltered environments, e.g. subtidal reef flats and lagoons. The depth range of this species is 10-12 meters / 33-39 feet. Juvenile specimens tend to be closely tied to specific coral heads. The largest scientifically measured Blue Green Chromis was 8.0 cm / 3.1 in. Just as the common name suggest, the colouration of the Blue Green Chromis varies from pale green to light blue. During nesting, the male fish will develop a yellowish coloration with a blackish posterior. The Blue Green Chromis (Chromis viridis) looks very similar to the Black-axil Chromis (Chromis atripectoralis), but you can recognize the Black-axil Chromis by the distinct black blotch that is present on its inner pectoral axil. In some specimens, the black spot is really small and hard to notice. In addition to this, the Blue Green Chromis is normally smaller than the Black-axil Chromis. 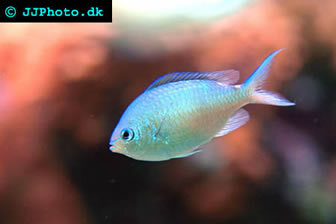 The Blue-green Chromis is a tolerant marine fish that can be recommended to novice saltwater aquarists. The Blue Green Chromis should be kept in groups consisting of at least six individuals. They will establish a pecking order within the group and stay comparatively peaceful in the aquarium. It is one of the most peaceful damselfishes, but can become a bit aggressive towards other species when it is time to breed. It is not advisable to house six Blue-green Chromis fishes in an aquarium smaller than 30 gallon / 115 litres. The water temperature should be kept within the 22-27° C / 72-80° F range. The recommended pH-value is 8.1-8.4 and the recommended carbonate hardness 8 - 12° dKH. The specific gravity is best kept at 1.020-1.025. The Blue Green Chromis is considered reef safe. The Blue-green Chromis feeds on phytoplankton in the wild, but will accept most types of food in the aquarium. Feed it many small portions throughout the day instead of just one or two large meals. You can for instance combine flake food with frozen, fresh and live food. Providing the fish with some algae or algae based food is recommended, since it always ingests a certain amount of algae in the wild. A varied diet is important. Breeding takes place on sand and rubble. The male fish will build a nest and several females will share this nest. The nest is typically filled with a large amount of eggs that hatches within 2-3 days. The male fish guards the nest and uses its caudal fin to fan fresh water over the eggs. Eggs that fail to develop are devoured by the male to prevent them from turning into breeding grounds for bacteria and fungi that may harm the offspring. As mentioned above, nesting males become yellowish. During the breeding period, the Blue-green Chromis can become more aggressive than normally. Plenty of live food and optimal water conditions seem to trigger spawning in Blue-green Chromis.